Okay. Let’s get real here for a minute. Parenting is hard. Like some days I’m convinced my child is trying to send me over the edge. 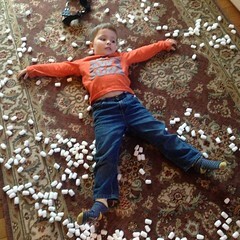 The other day he thought it would be fun to dump packing peanuts on our living room floor and make snow angels. Those later became “snowballs” he threw at the dogs…who promptly started eating them. Don’t worry, they’re cornstarch. I sometimes wonder what I’d do if I didn’t have my mom-posse to run to for support or help or just a minute of griping. They also can sit at the kitchen table and chat while the kids put on a show complete with guitars and microphones. (Thanks, Grammy & Baba.) They know to sidestep the Lego on the floor and to ignore the fruit snack ground into my couch. And they get it that dinner probably won’t include quiet conversation. 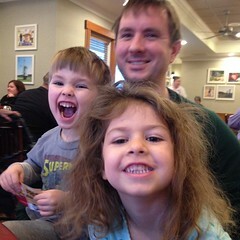 In fact, they’ll laugh–or at least pretend to–as my kid tells a knock-knock joke that makes no sense at all. And I love them for that. And my kid loves them for that. But, maybe more importantly, they need those people. Parents make us roll our eyes. Maybe not as much now that I’m in my thirties, but at ten and sixteen and even at twenty, my parents were just the goofballs who embarrassed me in public. But my friends’ parents were cool. They got it. They listened. 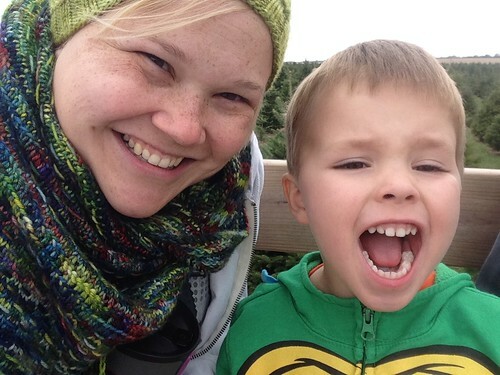 And I want that for G. He might be convinced I don’t “get him”, but hopefully one of my mom village will. And hopefully they’ll be able to steer him in the right direction when he’s too embarrassed or angry or annoyed to come to me. And I can only hope I have the opportunity to do the same for them. Because I know they love my kid nearly as much as their own, just as I do theirs.